Source Naturals Melatonincomes in a wide range of dosage options. Warnings: Use only at bedtime. For adult use only. Not for use by children, teenagers, or women who are pregnant, may become pregnant, or breastfeeding. If you are under medical supervision, or have an autoimmune disease, diabetes, a depressive disorder, a thyroid condition, epilepsy, leukemia, or a lymphoproliferative disorder, or are taking MAO inhibitor drugs or corticosteroids such as hydrocortisone or prednisone, consult your physician before using this product. Do not take when operating machinery or driving a vehicle. Do not use if either tamper-evident seal is broken or missing. Keep out of the reach of children. Store in a cool, dry place. Notes: Available in multiple flavors and forms. Non-GMO. Suitable for vegetarians and hypoallergenic. Contains no yeast, dairy, egg, gluten, corn, soy or wheat. Contains no sugar, starch, salt, preservatives, or artificial color, flavor or fragrance. Recommended Use: 1 to 3 tablets at bedtime. Do not take more than 5 tablets daily unless recommended by your physician. 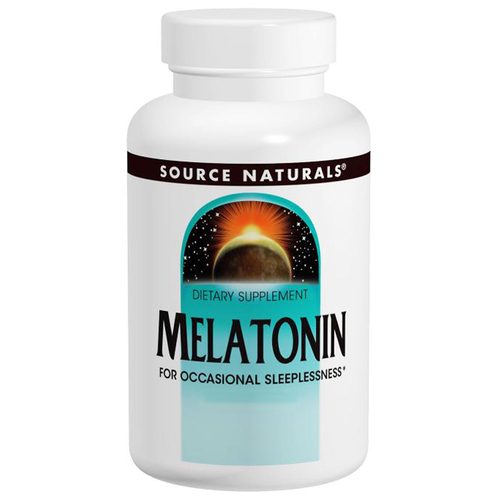 The customer reviews posted below are based on individual consumer experiences and may NOT necessarily represent what expected results will be from using or taking Source Naturals Melatonin - 1 mg - 200 Tablets. These results may not be typical and you should not necessarily expect to receive the same results. Actual results may vary. I love using melatonin before bed to achieve a more restful sleep. Much more rested agreement the next day. The dosage of 1mg works very well because it does not make me sleepy during the day. I recommend for those who have difficulty shutting down before sleeping and for those who want to have a sleep that recovers more. Melatonin of extreme quality. I have used other brands, but I have adapted perfectly with Source Naturals. It's the best!! !